Here is a complete update on Hurricane Irma. upper left corner. 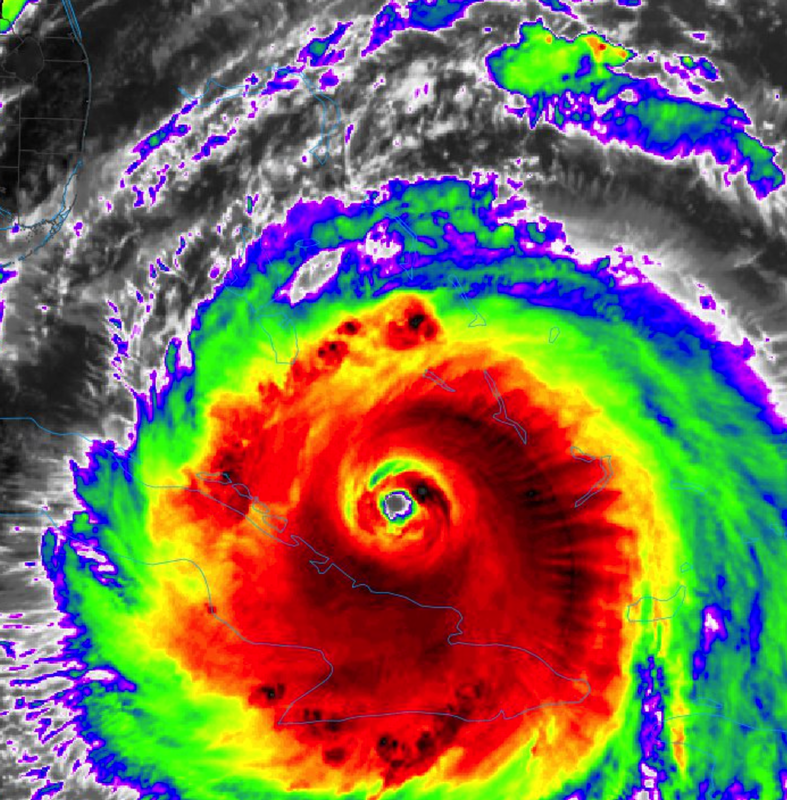 My analysis of the situation is that the eye has been reorganizing and, if the reorganization is successful, Irma will strengthen again to Category 5 status. The pressure has dropped three millibars since noon. There is no reason for significant weakening to occur. Even yesterday, there was a fair amount of spread to the computer models' forecast path. 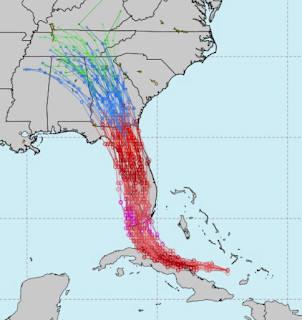 Now, all of them are across the Florida Peninsula but the effects of the exact path and intensity are quite significant. AccuWeather is forecasting the eye to move across the central Florida Keys and then into south central Florida and north up the Peninsula. 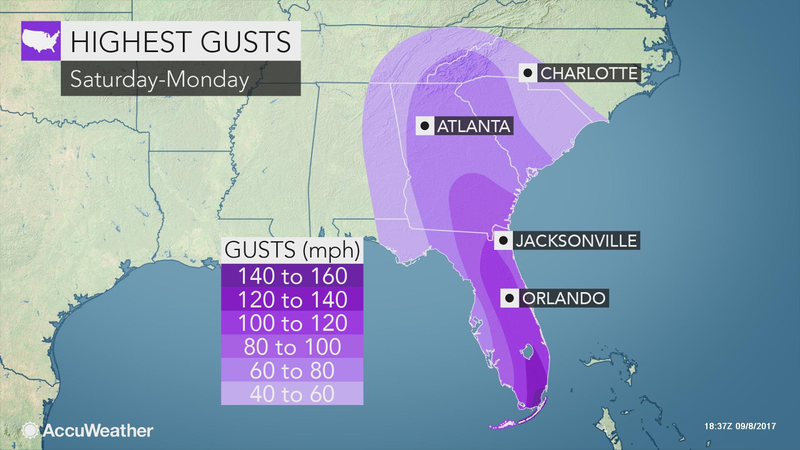 This means somewhat lower -- but still dangerous -- winds in Miami than I depicted below. 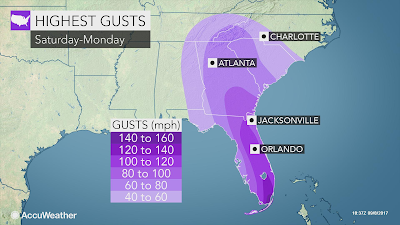 This AccuWeather's forecast of winds across Florida and the most likely scenario, in my opinion. Winds in Miami-Dade and Ft. Lauderdale will gust to 120 to 140 mph. Above the tenth floor of buildings, wind gusts could exceed 150 mph. Note the damaging winds extend from Atlanta to Greenville-Spartanburg and the mountains to their immediate north. Power failures are quite possible. IF rapid re-intensification occurs, winds could be a little stronger and a little farther west. So has to give you the range of possibilities, here is a map wind gusts in that scenario. 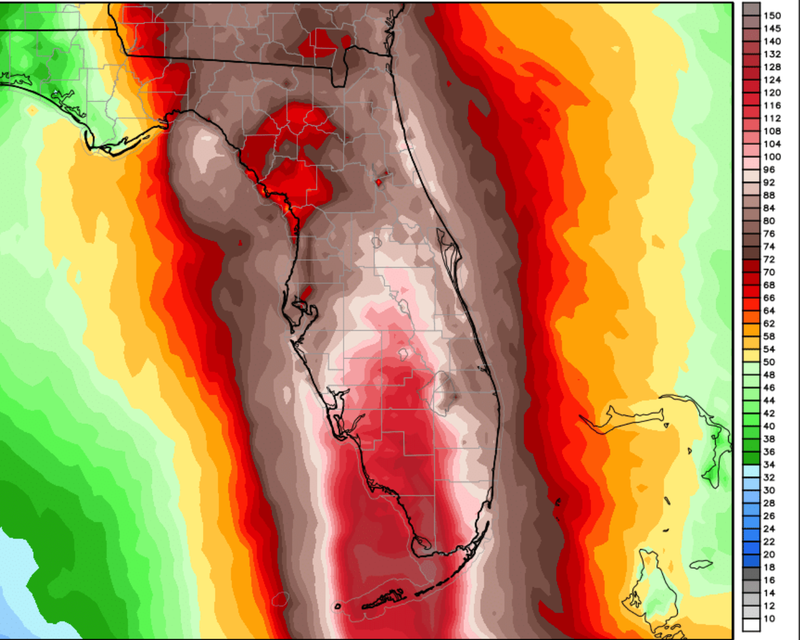 Those are peak gusts above 150 mph in the central Keys, through the Everglades and to 100-110 mph near Orlando. 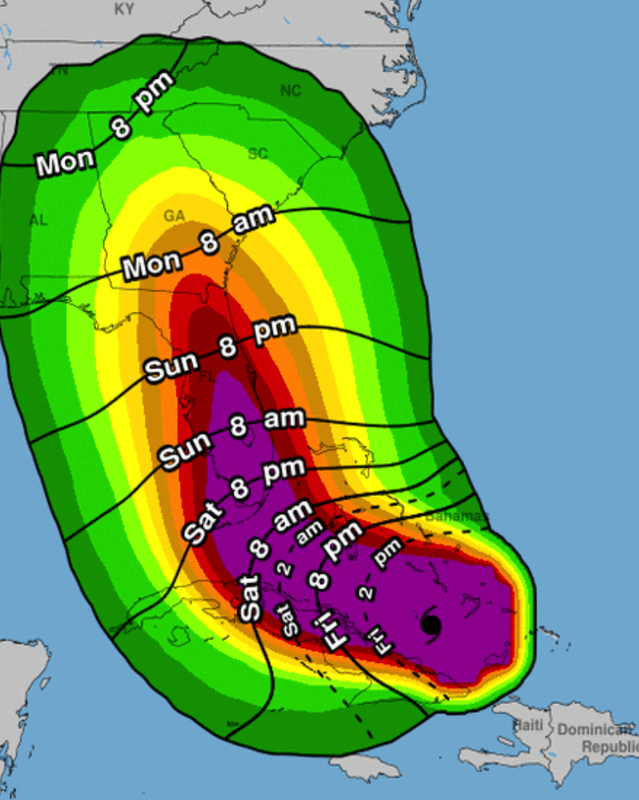 In this scenario, there will be severe damage in Naples and even Miami will have gusts to 100 mph. Here is a map of the most likely time of arrival of tropical storm force (sustained 40 mph) winds. 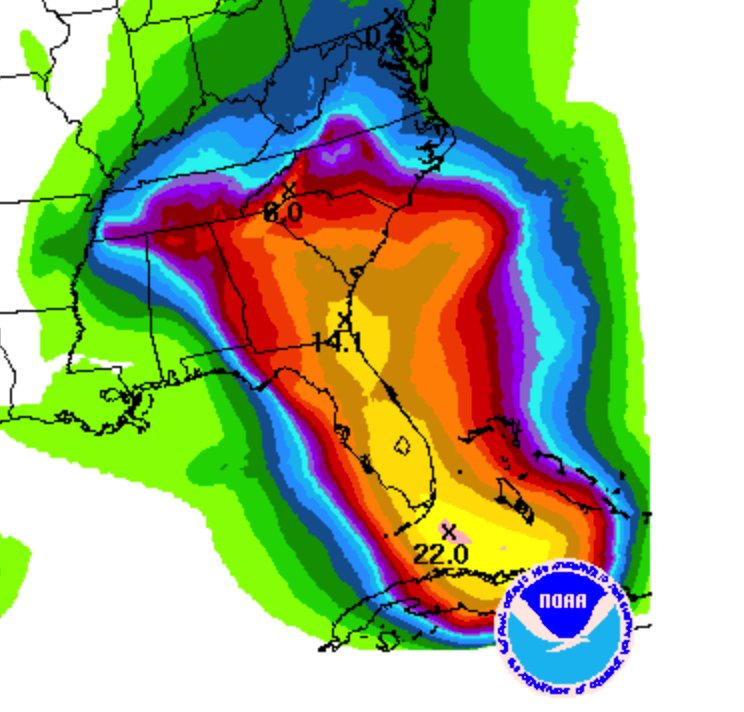 The colors are the probability of experiencing sustained winds of 40 mph or higher during the duration of the storm. We now turn from the threat from wind to the threat from water. 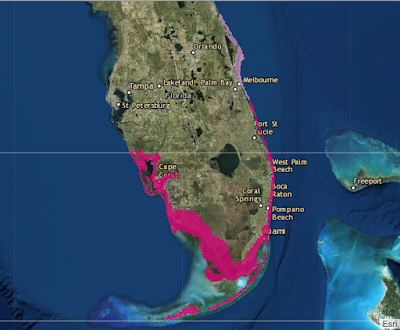 The red area is a storm surge warning and pink is a storm surge watch. 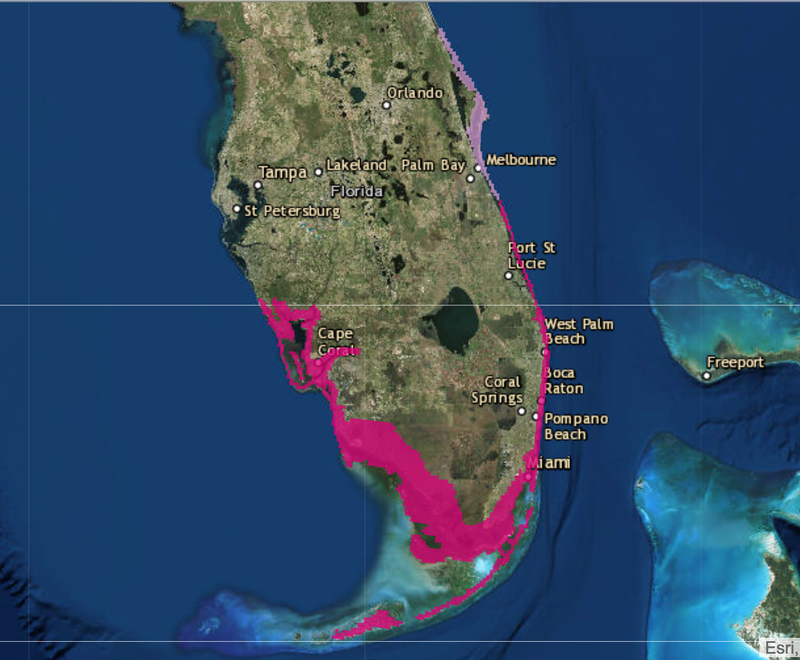 The storm surge will be 10 to 15' above sea level in some areas of the warning zone. 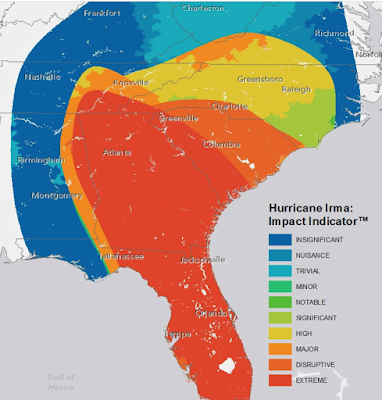 From AccuWeather's analytics group, the map below is a forecast of the likelihood of structural damage and power failures weighted by population density. There is also a serious risk of flooding. The map below is total rainfall expected from Irma. Turn off the gas, electricity and water before you leave. Photograph your possessions for insurance purposes. If possible, upload them to one of the online photo repositories for backup. Make sure you have extra cash. If you are concerned about the condition of the food in your refrigerator, put a coin on top of an ice cube. If the power fails and temperatures rise in the appliance, you'll find the coin at the bottom of the cube when you return. Make sure you have your meds. That is the last comprehensive update for the evening. I will do a brief update later this evening.